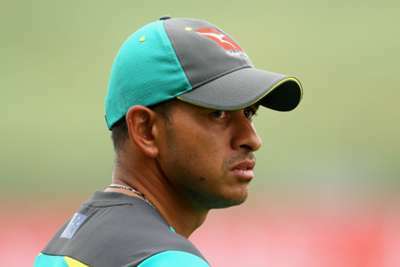 Usman Khawaja is a doubt for Australia's home series with India after suffering a meniscal tear ahead of play on day three of the second Test with Pakistan in Abu Dhabi. The opener was off the field throughout Thursday's play as Pakistan forged a huge second-innings lead, the hosts leading by 487 runs at stumps, needing nine Australian wickets to win the series. Their task could be made easier with the news of Khawaja's left knee injury, although Australia have not ruled out the 31-year-old batting if required. "It was confirmed today [Friday] that the left-hander will likely require surgery on his left knee after a training mishap during the second Test," cricket.com.au reported. "Khawaja went for scans late on Thursday, which revealed that although he has not re-torn his anterior cruciate ligament, he has suffered a meniscal tear." JUST IN: It's a big blow for Usman Khawaja has a meniscal tear and will likely need surgery. After the conclusion of the Pakistan series, Australia are not in Test action until December 6, but Khawaja – who rescued a draw for his side in the first Test with a stunning 141 in the second innings – is now a massive doubt. Pakistan also had an injury concern heading into day four with captain Sarfraz Ahmed not taking to the field after being hit on the helmet while batting. Sarfraz was struck by a Peter Siddle delivery and was taken to hospital for checks. Mohammad Rizwan stood in as wicketkeeper, while Asad Shafiq led the team.